It was brief, I know. Things don’t always work out the way we would like them to. I thought it was great, at first. Life is already taken up with family and work. Why am I trying to find the right answer to fix the serious problem I have with this blog? 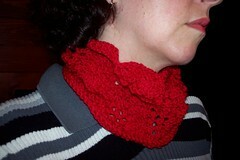 Lesson learned, stay put, keep things simple and just knit! I’m moving back to my old blog. I would love it if you come visit me over there from now on. I promise, no more moves. I’ll deal with my comment emails (or lack of issue) in my comfort zone. Besides, they did some wonderful updates in the last month since I had been gone. Yep, moving back to the old neighborhood, won’t you join me? of Graham Crackers. That’s the official title to the neighborhood. We are so close-knit that we spend holidays, bonfires, bbq’s and now, camping together. It is hard to think that back in 1999 when we purchased our acreage that we would have landed so well. Eventually, we all moved onto our properties, building our homes and our lives together. The world isn’t like that, much, anymore. Camping this past year, we used our friends new, small, yet beautiful little teardrop trailer. It was great, except, there was not toilet. We hiked up to the cabin to use the facilities…I was always on the look out for some wild animal, as we were up in the mountains, no electricity, no cellphone coverage. Boy…the stars were so awesome to see. DH and I talked about getting an RV so we would not impose on our friends and because I wanted a few amenities. We could not be left out of the camping scene. Tada. Here is is. 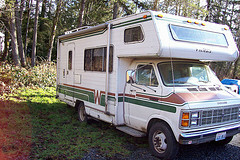 Our new (old) RV. 1979. It needs alot of tender loving care to give it a grander appearance, but the motor and the workings are sound. Six new tires, new cushion covers. Some cleaning, painting and new flooring, we will still come out ahead. I am going to keep a small scrapbook of the “beginning to end” of cleanup, repair and then into our camping trips. It should be fun. P.S. My first thought once I got it home, was the items to make an “emergency” sock knitting kit to keep in the RV, just in case I ran out of projects or had forgotten them at home. Eee-gads…I couldn’t camp all weekend without knitting…it may drive me to drink. words that Brenda Dane of Cast-On spoke in her most recent podcast. This had to be one of my favorite podcasts. I have so enjoyed all of her episodes, but this one seemed to hit home with me. Now to wait and see…. This morning was spent going over DD#1 college applications to Western and Central. It took three hours to make sure everything was “just right” on the Western app and 30 minutes for Central. I’m 99% sure she will get accepted by Central…her SAT scores and GPA gave her a high enough index that she should be an automatic “in”. Western, not so sure of. Either one will work for her. Western works better for me, as her brother is there. I also believe the baby will want to be going to Western. She has three years to figure it out. Whew…$100 poorer but good to know it’s all done…now to wait and see. Windy, cold and maybe a new project. It’s cold, it’s windy and maybe, just maybe, I need to start this. It would have been a welcomed warmth as I didn’t start the woodstove tonight, running around feeding the chickens, dinner for the girls and I, then my book got in the way. I haven’t knit too much into this new year, having been engrossed in a book. A few rows here and there at lunch, but nothing that put any length onto the sock. I HAD to read my book. Ravelry is such a great place to meet other knitters. I received a message from one member and a hot water bottle was mentioned for aches and pains. Ah-ha. Where is mine. Must find it. It needs a sweater. So…while after I finish my second sock, I will be stash busting for my hot water bottle. Thanks to Five Senses for the idea.